Long, straight cuts, with an unrefined waterjet that only provides simple acceleration, might be all you need. But you are not cutting long, straight cuts all the time, are you? A waterjet is a machine tool that shows its true benefit when it is cutting complex geometries on a variety of materials. In abrasive waterjets, hardware performance only provides a portion of the potential cutting performance returns. An optimal software controller is capable of extreme precision throughout every angle and curve in a cut while increasing speed of production and reducing cost of consumables. To get the full value of your abrasive waterjet, you need the best hardware coupled with the best optimal software. When software is done right, the waterjet manufacturer focuses on programming as a foundation of their machine tool rather than an afterthought. With advanced cutting models (using the abrasive waterjet’s hardware as a base), the software is able to control your machine’s motion faster and far more precisely to generate the end result exactly the way you program it. To help illustrate the point, consider race car driving. The car is your waterjet hardware, and the driver is your software controller. “If you have a great race car and a brand new driver who isn’t really good at driving, they’re going to do okay on the straights,” explained Carl Olsen, the Director of Software Development at OMAX® Corp. “They are going to floor it and as long as they can stay in their lane they’re fine. That’s where a lot of traditional waterjet machines still are.” What a lot of software programmers don’t take into account is how a waterjet jetstream behaves. Abrasive waterjets display complex behaviors. It is not a rigid tool like a saw. Traditionally, this has made abrasive waterjets difficult to program, specifically on corners where the nozzle would have to slow down to allow for the jetstream to catch up before changing trajectory. 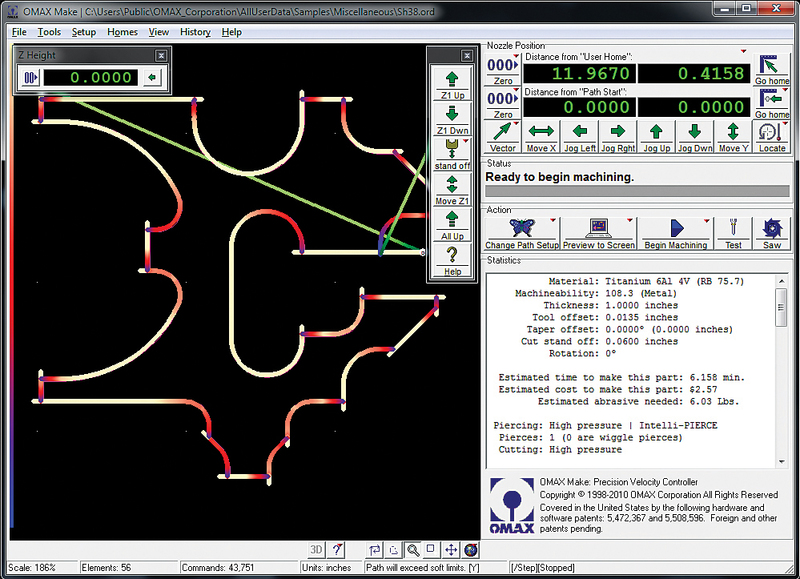 OMAX’s software is developed alongside the abrasive waterjet hardware. Using empirical data on how the jetstream behaved on the specific configuration of nozzle, abrasive, the material cut, etc…, the developers are able to better adjust for what is actually happening at every single point along your toolpath. To continue the race car analogy, Olsen said, “If you want to start a formula one team from scratch, you get yourself a car and you get yourself a driver so the two go hand-in-hand.” This isn’t the sixteen-year-old kid driving for the first time. This is a trained professional who knows every aspect of the vehicle they are controlling. From the data, the programmers are able to develop cutting models to input very precise computations relevant to how an abrasive waterjet works. The end result is a hardware/software integration that saves you money because cutting time, cutting pressure, abrasive use, water use, and material is all optimized in the controller’s cutting models. “OMAX was formed around the idea that we would design highly optimized software for the machines,” said Olsen. In 1993, when OMAX Corp started, abrasive waterjets used basic g-code to control the x/y of the nozzle as well as its speed. A number of third-party software controllers were available for milling machines. Still, no one had written a controller software that understood the physics of abrasive waterjets. Olsen continued, “The reason we made our own controller is because we couldn’t find one that would do what we wanted. It’s not hard to find components and assemble them into a machine. What’s hard is to take those machines to the next level to make it an optimized part.” Optimization, in this case, is done by constructing a controller that is created to drive the abrasive waterjet for what it is. OMAX’s software, Intelli-MAX®, has seen several iterations as it has worked to hone abrasive waterjet cutting as well as respond to customer needs. In the 1990s, the first generation of software was built on the geometry around how an abrasive waterjet behaved. Generation three’s cut quality and speed were improved when better computing processing power and better code capabilities allowed for a stronger understanding of corners and motion control. Currently, Intelli-MAX generation four has benefited from even more research into cutting models. OMAX has conducted thousands of empirical tests on thousands of material samples to understand how the abrasive waterjet functions with each. 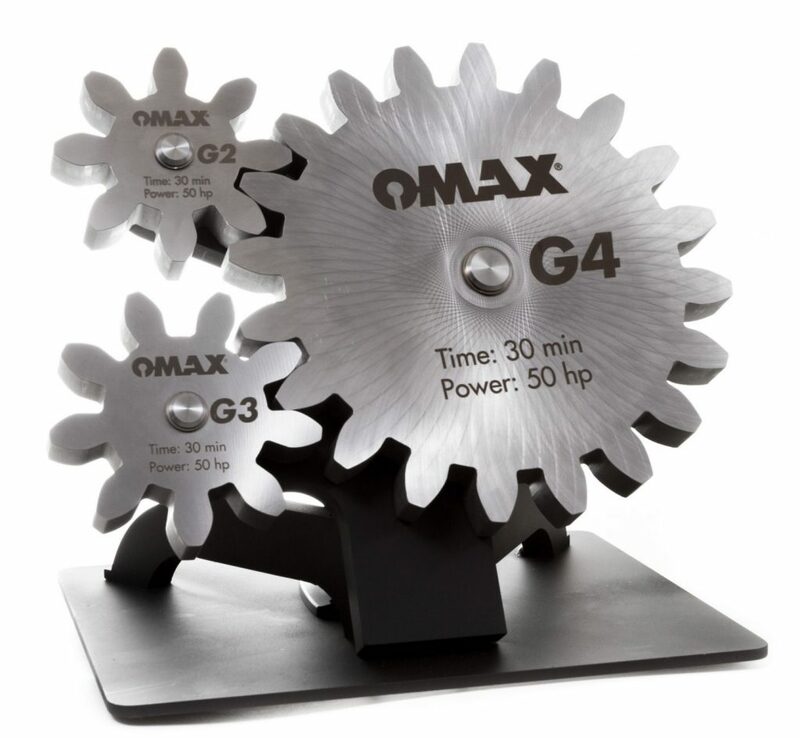 At generation two, an OMAX machine was able to process a gear with 8 teeth and 26 inches of tool path in thirty minutes. Generation four can cut 20 teeth with a 63 inch tool path in the same amount of time. Generation four of Intelli-MAX is the most integrated controller software available, allowing for faster acceleration, faster and more controlled deceleration, as well as a faster and higher-quality cut. Evolved software can make a huge difference in efficiency. For example, when comparing cuts of a 40 inch tool path of a Geneva wheel, a 94ksi intensifier pump with second-rate software cuts this part in 50 seconds and uses 1 lb. of abrasive. The same part cut with 60ksi direct-drive pump, paired with optimized software, took 41 seconds and only .68 lbs. of abrasive. The time and abrasive saving are obvious when improved software compliments the efficient direct-drive pump. On top of that, since the intensifier pump is working so much harder, the wear on the pump and plumbing erodes your abrasive waterjet system faster. Software progress moves beyond standard abrasive waterjet operations. The Tilt-A-Jet® is an optional accessory on OMAX waterjets that can position the nozzle at an angle calculated by the software to exactly offset the taper from the jetstream. Taper doesn’t disappear–it just gets moved to the scrap part of the material, leaving your part with exactly square edges. With a tilting head, the controller can speed up even the straight sections, just a little bit, by tilting into the cut in order to improve the surface finish without having to slow down quite so much. OMAX’s race car driver went from knowing how to drive on the track to learning how to better bank the turns. Waterjet cutting operations became smoother and subsequently faster. For the operators, it’s a simple click of a button on the OMAX interface to enable taper compensation. Abrasive waterjet is a tool that could only have been produced in an industry 3.0 environment. With the level of physics and variations in cutting, increased automation of production through the software controller is the only way to make abrasive waterjet technology viable and, to some extent, possible. That increased automation will continue to progress into the future. In terms of abrasive waterjet software, the right integrated controller software will have an advantage in what comes as we move toward Industry 4.0. 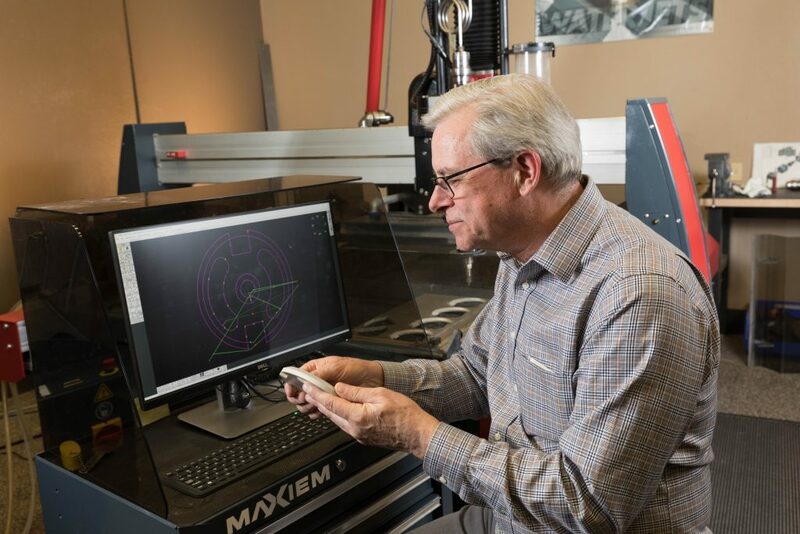 Given that the integrated software already has the means to negotiate the capabilities of the complex behaviors exhibited by the abrasive waterjet’s jetstream, the progress in cutting model research is sure to continue. Adding the speed of cutting, to an intuitive interface, to an iterative system of software development, will always be a sure fire bet on future technology. Twenty years ago, if you had bought an abrasive waterjet that included an integrated software controller, and you made no other improvements to the machine other than regularly updating your software, you would notice your production time speeding up tremendously. These increases in speed would have saved you money in electricity, water, and other consumables. In addition, the increase in software capabilities would have increased your capacity to take on more waterjet cutting work. 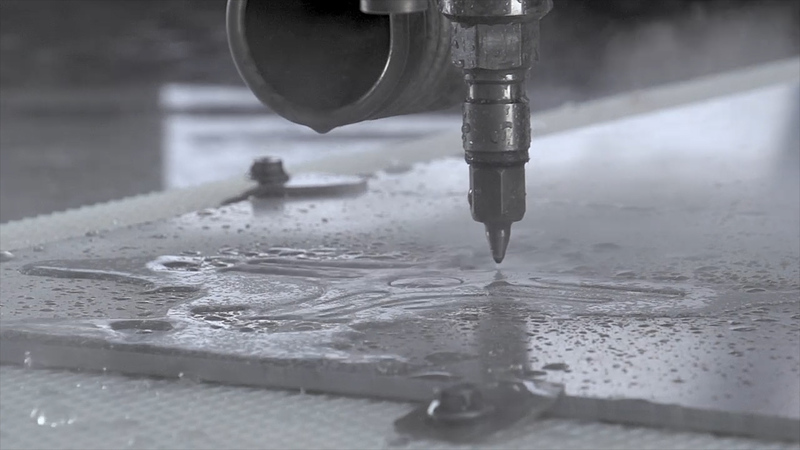 Twenty years from now, how will your software improve your waterjet cutting? Based in Kent, Washington, OMAX Corporation is the global leader in advanced abrasive waterjet systems that cut virtually any material and thickness with unmatched speed and accuracy. Owner of the OMAX and MAXIEM brands, the company provides a comprehensive selection of JetMachining Centers that feature intuitive software controls and incorporate the most efficient pump technology available. In developing its machines, the company designs, manufactures, assembles and tests components as a complete system to ensure optimum performance. The company also has the most comprehensive service and support network in the waterjet industry to keep its customers ahead of the manufacturing curve.